"Early Texas was settled by pioneers who came mostly from states of the Old South. These Southerners brought to Texas their music, cooking, home crafts, and the institution of slavery. Southern men also brought a proclivity for violence, form eye-gouging, knife-wielding brawls to blood feuds and formal duels. The rough-and-tumble Texas society embraced knife-fighting and pistol duels and blood feuds. The popularity of Sam Houston among Texans was enhanced by an 1827 duel in which he shot and nearly killed his opponent and by an 1832 brawl in Washington, DC, in which he thrashed a congressman who pulled a pistol on him." "Stephen F. Austin's colony in central Texas, established in 1822, enjoyed a short period of goodwill from the Indians but ultimately was saved by its militia. When the goodwill from the Indians ran out in 1823, Austin found it necessary to form a militia from his colonists to protect from Indian attacks. This was done with the approval of the Mexican government in Bexar. The Mexican government in for the colony, but this was just after Mexico's long war with independence from Spain, from 1810 to 1821. Mexico was in shambles and had only about 250 troops in all of Texas. So Austin's colony was on its own, and its survival in the first several years was precarious. Austin's colony was saved by its own motivated and its leadership. "[...] The settlers were basically farmers with no military experience, and not everyone owned a gun. They had not come to Texas expecting to have to fight, and they served only reluctantly in the militia and for short campaigns. In this, the early militia acted more like a posse. The men were usually mounted on their farm horses or mules but fought from the ground since they were not horsemen. In the early years of Austin's colony, their numbers were meager, and they avoided confrontation in favor of treaty with the Indians. ​ "[...] By 1826, there were 1,600 people in Austin's colony. Manpower was not the problem -- guns were. The total strength of the militia reached 565 men, but there were only 345 weapons (muskets plus pistols). So the militia lacked 200 weapons for each person to be armed. Still, 1826 was an active year for battles between the militia and the Tonkawa and Karankawa. By the end of the year, the increasing strength of the militia and Austin's successful strategy for dealing with the Indians had overcome the immediate threat of extinction for the colony. The colony's militia was no killing machine, with inexperienced members and insufficient armament, but under Austin's leadership, it made the difference for the survival of the colony." "Apparel made up from other pelts was fashionable. Moses Evans, the 'Wild Man of the Woods,' wore a vest made from snakeskin to a wedding at Washington-on-the-Brazos, where he lived in the late 1830s. ... Black bearskins also proved useful ...."
"Most of the Alamo defenders wore typical civilian clothing of the period. Some who had prior military service may have worn parts of their old uniforms and used pieces of their old equipment. Even volunteers with no prior service may have had military clothing and equipment, because the United States government occasionally sold surplus goods at public auction. Undoubtedly, there was a liberal mixture of civilian clothing and gear. Some Texians may have worn buckskin clothing, as popularized by Hollywood movies, but most would have been dressed in garments of manmade fabrics such as wool, linen, and cotton. 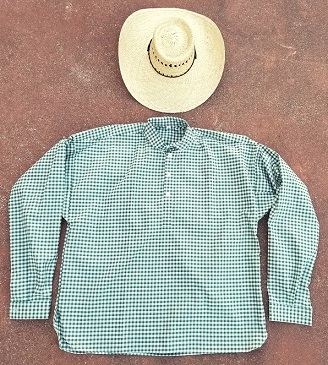 The Tejanos, of course, would have worn clothing typical of their Mexican heritage." "The Texians would ... have armed themselves for hand-to-hand fighting with Bowie and other long knives and tomahawks." "Brothers James and Rezin Bowie developed a large fighting knife, and the combative James was never without his weapon, even when fashionably dressed. The big, heavy blade often had a clip point on top, which held a cutting edge for backstrokes. When David Crockett first saw Bowie's famous weapon, he is said to have remarked that you could tickle a man's ribs a long time before drawing a laugh. In various models, the 'bowie knife' became immediately popular in Texas. Other dangerous Texas knife-fighters include Henry Strickland, 'The Bully of the Tenaha,' who was slain during the Regulator-Moderator War." "Bowie knives were made famous by James Bowie long before the Siege of the Alamo. Large and heavy, 'Bowie'-style knives were more suited for fighting than for regular chores. Blacksmith Rezin Bowie, James' brother, made the one that James carried during the Siege of the Alamo. More than likely it was taken as a trophy by a Mexican soldier after the battle, and its current whereabouts is unknown. Several knives that could possibly be Bowie's have surfaced over the years, but none have been positively authenticated." "The Texas frontiersmen of the late 1830s relied heavily upon their Kentucky and Tennessee rifles for distance shooting. Many of the Indians' opponents carried belt pistols -- or horse pistols -- of many calibers, including .54 and .65, although their effective range of perhaps 40 yards made them essentially useless unless fighting was engaged under extremely close quarters. The first of Sam Colt's newly patented revolving five shot belt pistols manufactured in 1836 were models of .28 to .36 caliber, but few of them had made their way into Texas by 1839." "The arms used by both sides at the siege of the Alamo in 1836 were mostly of British manufacture. Contrary to popular opinion, there were probably only a few Kentucky long rifles in the hands of the Texians. The most common gun arming both the Texians and Mexicans was the British East India pattern musket. Mexico had purchased a great number of these muskets in the 1820s as surplus from England and made them the standard weapon for the Mexican army. These were not rifles but rather smoothbore muskets. The Texians captured a store of five hundred of these muskets at the fall of Bexar in December 1835 when General Cos surrendered. In any case, this British army musket had had been in America since early 1700s. It was the main weapon used by both sides in the American Revolution in 1776, although a small number of Kentucky long rifles were also used in that conflict. But the British musket, nicknamed the 'Brown Bess,' was the weapon used by England in its period of colonial expansion. It was very reliable and easy to load and was used by the British infantry until 1838. Thereafter, the Brown Bess was used around the world into the 1880s. "[...] The Kentucky long rifle was a more accurate but was slower to load, producing only about .36 to .45 caliber, and were all handmade. Since there was no standard bore size, the rifleman had to carry his own lead balls. These characteristics were not a problem in their early use since they were developed for hunting deer in the woods of the Northeast. The long rifle had an effective range out to three hundred years. But with a barrel length of forty-eight inches or more, the long rifle was rather cumbersome for the western frontier. "The long rifle was developed in America in the early 1700s by German immigrants in Pennsylvania and was initially called the Pennsylvania rifle. The German immigrants were familiar with the rifling process used for the German Jaeger rifle, but the long barrel was an American adaptation. Davy Crockett was one of the Alamo defenders who knew how to use the long rifle effectively. They were especially useful at picking off officers, scouts and artillery gun crews at long distances. This would have had a great demoralizing effect on the attackers, but its slower rate of fire would have been a disadvantage against charging attackers." "In its September 1, 1841, issue, the Telegraph and Texas Register reported that 'some rude chaps scalped the poor chief [Bowles] after his death.' Others were seen to cut away pieces of Bowles' body for souvenirs or personal charms." "Walter Lane of Colonel Landrum's regiment noted one 'festive cuss' from the new arrivals who had taken the liberty to cut a strip of skin from the back of Chief Bowles. The man told Lane that he planned to use the dried flesh for a razor strap and a good luck charm."